The “city of farewells” has its fair share of mysteries and legends, making it ideal for a day-trip from the northern capital. Kronstadt is also known as a “rebel city,” for its rebellion against the Bolsheviks. It is also known as a “city of farewells,” as white handkerchiefs were once waved to sailors departing for months at sea. Kronstadt is also a city of mysteries, and this is felt in every brick of its fortifications. Kronstadt can be reached by car or shuttle bus from St. Petersburg (No. 405 goes from the Chernaya Reka (Black River) subway station). From the south, there is a route through the city of Lomonosov to the island of Kotlin, which takes you through the newly built tunnel under the Gulf of Finland. If you are thinking of conquering the city from the north, then you can go through Lisy Nose (Fox’s Nose) or Sestroretsk. The route runs along both sides of the dam and is part of the St. Petersburg Ring Road. It is most convenient to book a tour, especially if it goes by boat around the forts. Buses and travel agencies and offices are located at Gostiny Dvor metro station. Closed to public access until 1996, among the residents of St. Petersburg, Kronstadt gained a reputation for having a rebellious undercurrent – a place where people lived by their own rules and would not tolerate outside visitors. They say that they ruled with their own law and order, sailors wore bell-bottoms wider than permitted, and in Soviet times, when the store shelves were empty and there were long lines for delicacies, one could always find caviar and sausage in Kronstadt. To get to Kotlin Island, where the city was built, was truly difficult. Kronstadt was considered a separate country, surrounded by checkpoints with heightened passport control and vigilant on-duty gunners. One could only visit the city with a guided tour at the invitation of a resident of Kronstadt; and there were never any complaints from mainlanders. Kronstadt was closed on the inside as well. For example, Fort Ino was used as a testing ground for high security. According to the stories of old-timers who served this underground structure complex, experiments were conducted to identify the effects of hard radiation on animals. The testing ground was later liquidated, but even so, access to the fort has remained closed for many years. The city keeps a lot of military secrets. As a Baltic Fleet base and one that closes off sea approaches with a complex system of canals and forts, Kronstadt developed a new type of weapon by raising a new generation of sailors. Fort Constantine Hotel is situated directly on the grounds of the fort. Only since 1984 has Kotlin Island become linked to the mainland by roads on the north side, running along the seawall. To reach Kronstadt via the dam, you will see a fascinating spectacle: on both sides of the water there are high concrete barriers built to defend the city from Mother Nature during her violent periods. But at times they cannot cope with the rebel sea, and the waves gush across the highway. In such bad weather, the road across the causeway to the island is closed. In 2011, a 2 kilometre tunnel was constructed, passing under the Gulf of Finland. If Fort Alexander is too difficult to reach by water, then go instead to Grand Duke Constantine, where you won’t have to swim. It is Kronstadt’s most visited tourist destination and is growing rapidly. Now, there is a yacht club and a cultural centre that houses powder magazines, batteries, and a barracks at the fort. From atop the fort, one can enjoy a beautiful view of the bay, including the mysterious Fort Chumnoy and Fort Pavel I, as well as the main attraction of Kronstadt, the Naval Cathedral, which is also visible in the distance. Throughout the history of the fort, the Constantine testing site tested only the newest types of artillery. 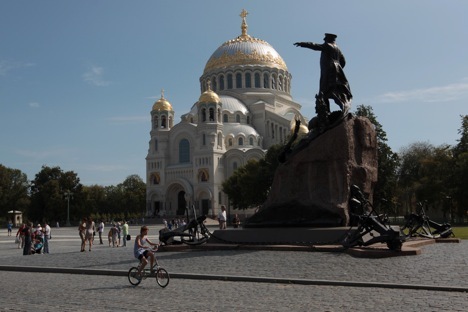 The Naval Cathedral of St. Nicholas stands in the centre of Yakorny (Anchor) Square – Kronstadt’s answer to the Hagia Sophia Cathedral in Istanbul. It is sublime: 71 metres in height, and the cross on the dome served as a beacon to mariners, as it could be seen at a distance of 30 miles. Every sailor had to give a quarter of their salary for its construction. It’s huge, round windows resemble portholes, the floor was laid with stone taken straight from the sea, and its dome painted like the sky.